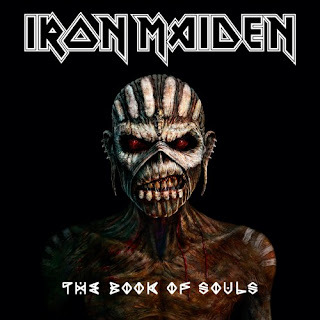 Hall of the Mountain King: Review: Iron Maiden, "Book of Souls"
I often think heavy metal fans are far too enamored with long songs. I’m guilty myself. If all the songs on a record are 8-10 minutes long, then it’s got to be epic, right? Maybe it’s a deep-seated rebellion against the punchy three-minute pop song that makes us think that way, but the epic metal that we expect isn’t always what we get. When word got out that Iron Maiden’s latest record Book of Souls was a double album with only 11 songs, there were ooohs and aaahs. There was a Maiden-getting-back-to-its-roots sort of feeling for some, since they are the band responsible for a great many of those truly epic long-playing metal songs of the past. After a few listens though, I tend to think of Book of Souls less as a double album than a single disc stretched beyond the capabilities of its content. 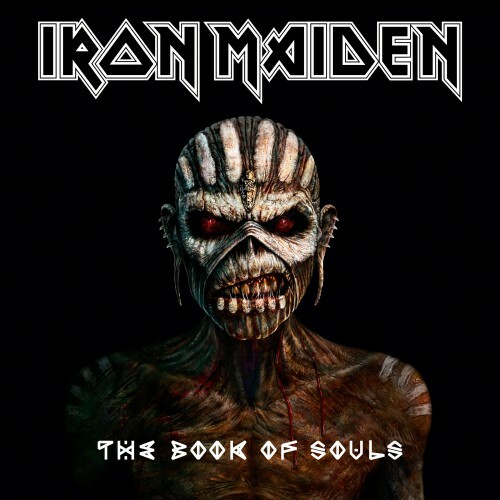 Book of Souls is a better album than anything that Iron Maiden has released in many years. It’s easily the best since Brave New World, which is my favorite record of the Bruce Dickinson reunion era. I just don’t think it’s quite worthy of the lavish praise that I’ve seen heaped on it. I realize that to complain that the songs are too long borders on sacrilege for some Iron Maiden fans, but in the case of this record, it’s absolute truth. Take, for example, “The Red and the Black,” the second longest song on the record, clocking in at 13½ minutes. When the song begins, I’m bobbing my head to a classic Iron Maiden gallop. Steve Harris’ bass is thumping, the guitars are chugging, there’s an epic lead lick thrown over that and Dickinson comes in with a vocal melody that echoes that lick. 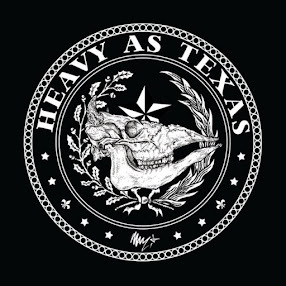 There are some woooah-oh-oh gang vocals that lead to a tougher, grittier guitar chug. It’s what Iron Maiden should be. The problem? By the time another soaring guitar lick and a change of direction in the song arrives around the five-minute mark, it’s already getting a little old. By the seven-minute mark, when the guitar solo arrives, it’s pretty much worn out its welcome. It winds on for another 6½ minutes without really going anywhere. I find myself humming that woooah-oh-oh bit over and over. It’s a nice hook, but every time I go back to the song, I have pretty much the same reaction. Ultimately, it feels like a good six-minute song stretched to 13. That’s the problem with most of the longer songs on Iron Maiden’s Book of Souls. They seem to be long for the sake of being long. Take album opener “If Eternity Should Fail” (8:28). It spends its first minute and a half playing on this spaghetti Western theme beneath some drawn out, echo-effect laden vocals by Bruce Dickinson. It’s a strange way to start a record, especially when what follows that is a driving classic Maiden track. The main guitar lick reminds me a little of the solo Bruce track “Ghost of Cain.” At about five minutes, the song takes a more uptempo turn for the guitar solo before returning to a repeated chorus loop for a minute or so, and then an acoustic fade out with a spoken word piece that’s a bit cheesy. If you clip the beginning and the end off, and get straight to the meat of the song, it would be one of the better ones on the album. The title track (10:31) is probably the best constructed of the long tunes. It opens with a little Spanish-influenced acoustic guitar that cranks up into an exotic electric riff. The keys swell up behind it and give us the feel of one of those classic, dramatic Iron Maiden epics. The chorus puts me in mind of something from Brave New World. About halfway through, the song kicks up into a heavy gallop in that tried-and-true structure they’ve made their trademark over the years. As good as it is, though, even it feels a little overlong. One of the most interesting and also most frustrating songs on the album is “Empire of the Clouds,” which is the longest song ever recorded by Iron Maiden, checking in at 18:30. Written entirely by Dickinson, the subject of the song is, not surprisingly, aviation-related – the crash of the R101 British airship. It features some of the most stunning moments on the record, mostly with Bruce Dickinson at the piano, accompanied by some dramatic flourishes by the rest of the band. It builds slowly to the gallop and heavy release before fading in the late going. It closes on a strong note returning to Dickinson at the piano again. The frustration comes from the fact that it could have been an amazing song – even at 13 or 14 minutes long – but it kind of loses its way in places. The shorter songs also offer a mixed bag. Fans will be pleased by bursts of the band’s classic sound, notably on “Death or Glory,” which wouldn’t have been out of place on one of the band’s early albums with Dickinson. The frantic “When the River Runs Deep” is another good example, though, as with most of the tunes here, the hook doesn’t rise to the level of their classics. There are things to recommend most of the songs on the record. “The Great Unknown,” after a bit of an overlong buildup (see the theme, here?) has one of the better head-bobbing grooves, but loses interest as soon as that’s over. The opening lick of “Shadows of the Valley” will certainly put fans in mind of the classic “Wasted Years,” though the rest of the song doesn’t live up to that promise. “The Man of Sorrows” might bring a little confusion with the outstanding “Man of Sorrow” from Dickinson’s solo career. Both open as quiet ballads, and they even have some similar melodic themes in the early going. This one, though, kicks up into a 1980s rock-influenced mid-tempo number that seems a little disjointed. And “Tears of a Clown” (not a Smokey Robinson cover) is just kind of boring. As I see the glowing reviews of this album from friends and colleagues, I can’t help but think that nostalgia is playing a part in those feelings. There are bits and pieces of classic Iron Maiden scattered around this record, but when put next to one of those records, there’s really no comparison. There are some fantastic moments, like the early portion of “Empire of the Clouds,” but no truly great songs as a whole. I’m just not feeling the love. Book of Souls is a good record by comparison to recent Maiden efforts, but when compared to their entire catalog, it’s mediocre at best.